US #C24 was issued four days earlier specifically for this flight. 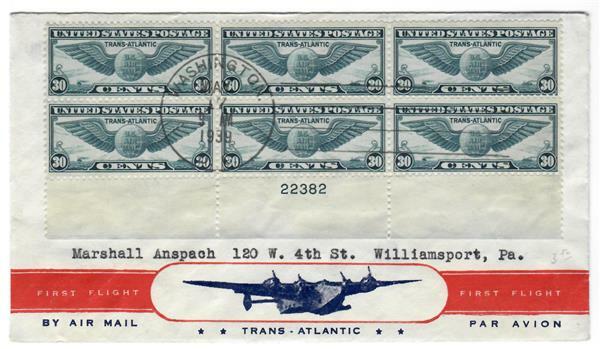 On May 20, 1939, the US Post Office inaugurated its official trans-Atlantic airmail service to Europe. The flight wasn’t the first to carry mail from the US to Europe. As early as 1919, individual pilots had carried mail across the Atlantic. And in the early 1930s, German and French airlines started airmail service across the South Atlantic between West Africa and Brazil. US #C24 – Classic First Day Cover. It was Pan American Airways’ president Juan Trippe who pushed for this new regular trans-Atlantic airmail service. In 1935, he had created the trans-Pacific mail and passenger service aboard the China Clipper, a Martin M-130 seaplane. By January 29, 1939, the first Boeing 314 arrived at Pan American to prepare for its journey. 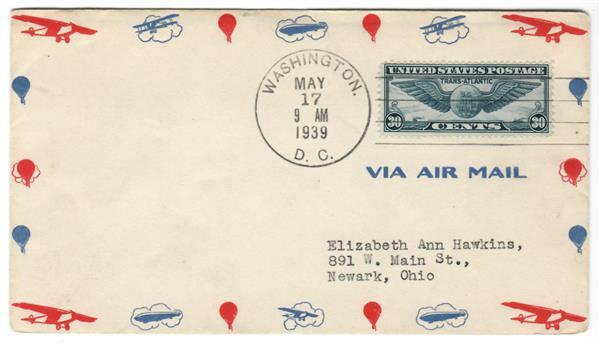 Item #MA1798 – Second Day Cover from May 17, 1939. Collectors began producing Second Day Covers because they would be rarer than First Day Covers. The Boeing 314 weighed 42 tons and was one-and-a-half times the size of the China Clipper, able to carry twice the weight. The plane included three lounges for passengers, a dining room, and 35 sleeping areas. The cost to fly as a passenger on the trip was $375 one-way or $675 round trip. 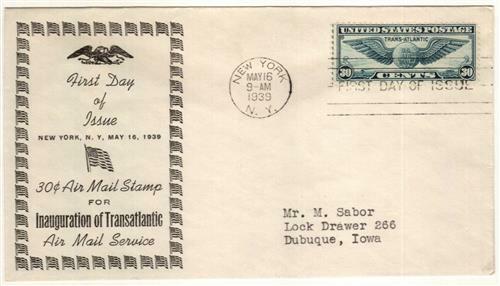 Item #MA1799 – Plate Block Second Day Cover. The first two Boeing 314s were sent to Pan American’s Pacific fleet. The third plane went to San Francisco, where it was displayed at the Golden Gate Exhibition, before being transported east. On March 3, First Lady Eleanor Roosevelt christened the plane the Yankee Clipper with a bottle that had water from the seven seas. 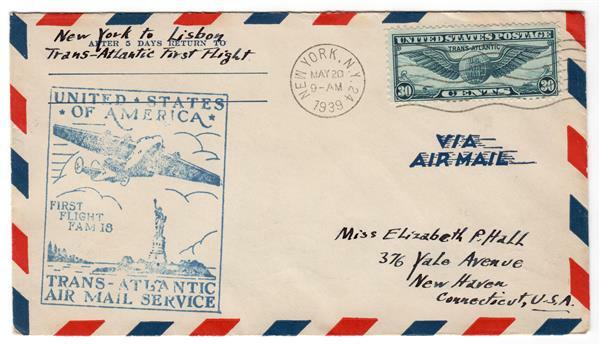 Item #MA1804 – First Trans-Atlantic Airmail Service First Flight Cover. After several weeks of preparation, the first trans-Atlantic flight aboard the Yankee Clipper began on May 20, 1939, coinciding with the 12th anniversary of Charles Lindbergh’s solo flight to Europe. The Yankee Clipper was loaded with 1,800 pounds of mail and took off from Manhasset Bay, Long Island around noon. The Clipper passed over the New York World’s Fair – just 500 feet above fairgoers – before heading out to the Atlantic. The Yankee Clipper made stops in the Azores and Lisbon, Portugal, before arriving at Marseilles, France after 26-and-a-half hours. 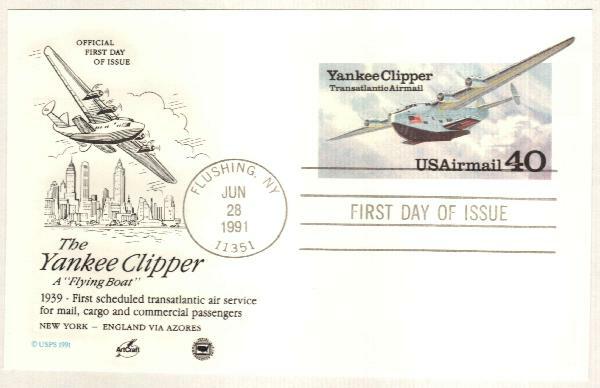 US #UXC25 – Yankee Clipper Airmail First Day Postal Card. A month later, the Dixie Clipper (also a Boeing 314) took the first passengers on the trans-Atlantic journey on June 28. Throughout the summer, the Boeing 314s made two weekly round trips between New York and London and Marseilles. Many of the trips east carried socialites and dressmakers, while the western trips carried fall designs from Paris fashion houses. These also included the first wave of immigrants to America to travel by air, including rich refugees from the Third Reich. Just days before the start of World War II, the Yankee Clipper was painted with US flags to show its neutrality. 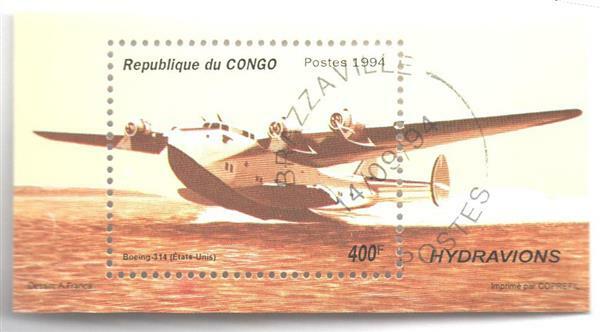 Congo #1071A pictures a Boeing 314. During the war, passenger service aboard the Clippers slowed and they were eventually pressed into military service, bringing men and equipment to Europe and the Pacific. By war’s end, the Clippers were obsolete and retired. Gibraltar #932-37 includes a stamp picturing the Yankee Clipper.